Enhance your washing experience with the new Freshcare+ range from Whirlpool. Freshcare+ uses a series of delicate steaming and tumbling actions to eliminate odours and keep your fabrics fresh up to 6 hours after the cycle has completed. The Freshcare+ option can be selected when setting the washing parameters or during the wash cycle, allowing you to enjoy perfectly fresh garments at a time you are ready to unload. The Whirlpool FWG81284W UK provides 8kg capacity, 1200rpm and an impressive A+++ -10% energy saving design using brushless induction motor. Benefit from the advanced motor and Soft Move system that uses tailored drum movements to suit any type of fabric. Ensuring the best laundry care and washing performance. Save up to 50% on energy, water and time with our innovative 6th technology which automatically adapts to laundry weight and selects the best washing cycle. 6th SENSE intelligent sensors adapt resources according to the size and type of load, offering savings of up to 50%* on energy, water and time. The Colour 15° option provides all the care and protection you deserve, while ensuring ideal washing results for all your coloured clothing. Select this option to wash a full 8kg whites wash in 1 hour at low soiled level. This Whirlpool Washing Machine features a child lock system, to prevent toddlers and children from accidentally changing the program. The Daily Load programme completes an average daily load (3.5kg) of mixed cotton and synthetic fibres at 40°C in only 60 minutes. This Whirlpool Washing Machine features a 1200 rounds per minute spin speed. 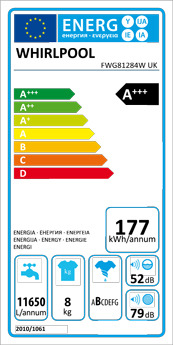 This Whirlpool Washing Machine features an outstanding A+++ energy rating, reducing energy consumption by 10%. while ensuring ideal washing results for all your coloured clothing. Included in the prices of electrical appliances on this site is a contribution to a Product Recycling Fund to ensure that waste electrical and electronic equiptment is collected and recycled in a responsible manner. When purchasing a new electrical appliance you can leave your old appliances in store for recycling. Where an item is being delivered, we will remove a similar old appliance for recycling provided it is disconnected, clean, FULLY DEFROSTED in the case of Cooling products, and ready for the driver at the time of delivery. Will PowerCity Recycle my old Appliance? Yes - PowerCity will take back your old electrical appliances at the time of delivering your new appliances provided they old units are disconnected, defrosted (in the case of Cooling items), clean and ready for the driver. You may also leave back old electrical appliances for recycling with us during opening hours to any Powercity Store. There is no purchase necessary to avail of this. Waste Electrical and Electronic Equipment (WEEE) is taken back free of charge on a one-forone, like-for-like basis. Waste batteries including rechargeable batteries are taken back free of charge. You are not obliged to make any purchase when returning old batteries. Each local authority must also accept household WEEE and small batteries free of charge at its recycling facilities. All WEEE and waste batteries must be recycled and should not be placed in any of your household wheelie bins. Make sure you always recycle all your old electrical goods and batteries. * POWERCITY Delivery Service - Dublin and surrounding counties Monday to Saturday (excluding Bank Holidays). Our Helpdesk Team will contact you on completion of your order to arrange your delivery. Small items may be delivered via outside couriers which can take 2 - 3 working days for delivery. * NATIONWIDE DELIVERY - available within 5-7 working days. To see a full list of Nationwide Delivery Areas. Please put the item in your basket and Select Home Delivery. Home Delivery Includes the Removal of Your Old Appliances for Recycling	provided they are disconnected and ready for the driver at the time of delivery. To see the delivery charge for any product please click the buy button to put the item in your shopping basket. Click the home delivery button which will appear directly below your shopping basket.